Size: Each page measures 24" x 40"
Title: 'A New and Complete Map of Scotland And Islands thereto belonging'. Published by Sayer and Bennet. A large, two-part wall map of Scotland that depicts the country in intricate detail. Hand-colored lines divide and subdivide the shires, and the index also includes forts, roads, military routes, and the sites of battles. Mountains are depicted pictorially, and bodies of water such as lochs are all labeled. At the upper right is a large inset of the Shetland Islands. The upper left corner contains a decorative title cartouche set within a landscape and displaying Scotland's coat of arms and several canons. The lower left contains a key of "the most remarkable places in Scotland." Ships decorate the surrounding water. Thomas Kitchin (1719-1784) was an English engraver and map-maker. His maps and atlases of England earned him the position of hydrographer to the King. 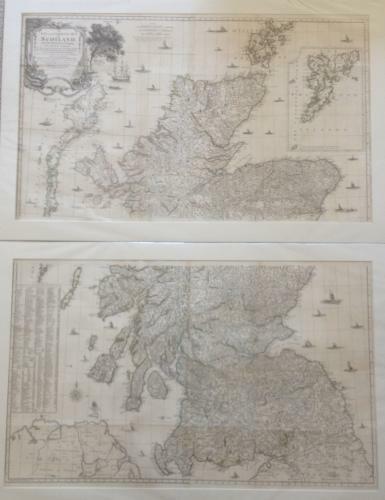 This large map of Scotland is a very impressive example of his work that is rare to the market.